She is able to stretch colors out over pliant bodies. People stand at the centre of the pictures imprinting amusing sensations on our eyes. The work of Arielle Bobb-Willis, a very young New York based Photographer, shows her potential of highlighting bright chromaticity without overloading the compositions. Rather, when looking at the subjects, what comes out it’s the soft balance between fluid movements in a static reality. She uses her art knowledge to celebrate the positive energy of colors showcasing something like a youth’s playfulness, thus it sounds extraordinary that her wonderfully vibrant pictures are actually her response to a particularly “dark” moment of her life. I had the opportunity to get in touch with her, who’s extremely kind, and ask her a few questions about her original vision. YT: Colors, lines, shapes and places compose the incredible symmetry of your eye-catching pictures. How does your creative process starts? A: Thank you! I start each shoot differently. Sometimes I have a prop I want to use, other times it’s a location I want to shoot in, or I find clothing that I want to shoot. So it starts off with one of those things and everything else builds around it. Before I shoot I always look at as much art that I love as I can ahah! Right now the artists I’m really interested in are Gertrude Morgan, Jacob Lawrence, Ida Kohlmeyer, Sadamasa Motonaga, Karel Appel, and Marcus Bartos. YT: In the interview for Metal Magazine you said that “The clothing I choose is mainly for breaking people apart in pieces not to make it look fashionable” and that you don’t see yourself as a fashion photographer at the moment. Nevertheless your work seems very close to the ideal of fashion maximalism proposed by forefront designers such as Martin Margiela, Comme des Garçon and Issey Miyake. Do you know them? If so, do they inspire you? A: I know all of them yes! And I do love fashion but I don’t focus on it as much as I do other areas of art. They are all very inspiring in different ways. 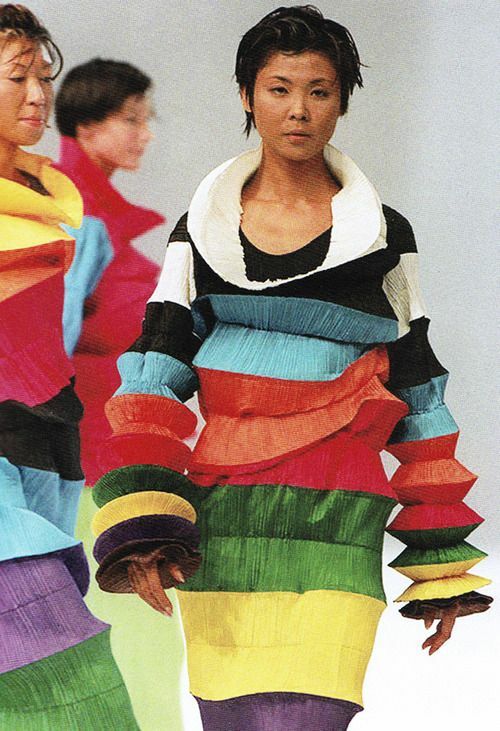 But I truly truly love Issey Miyake’s work. I think his clothing is closer to what I would want to shoot if I could and what I would personally wear. The shapes he creates are unbelievable. I am dipping my feet into fashion editorials at the moment. I want to remain open and see how my eye translates to fashion. The photos that Irving Penn took of Issey’s clothes are so amazing to me. I think my work has a lot to do with shape and movement and I feel his work embodies that as well. The accordion rainbow dress is still my favorite piece and if I could own it and wear it I would! YT: If you could choose only one of your pictures that would tell the better your story, which one it would be and why? A: I would definitely choose the photo of the two girls bending backwards (above). This is the first photo shoot I did in this new style… All of my photos emerged from this one. It was a new style because at this time my mind was changing. I feel change heavily and I wanted to express what It felt like to be moving on from the reality that I had built at the time. I started seeing myself clearer and I was really excited but of course somewhat uncomfortable with this new frame of mind I found myself in. James Baldwin said that “the artistic image is not intended to represent the thing itself, but, rather, the reality of the force the thing contains”. I felt for so long that I wasn’t saying or seeing myself enough in my work and I was holding back. I wanted to create this paracosm that was somewhere I would want to live in and thrive in. During this time I had an epiphany moment where I was super focused on not refraining from pushing myself and the people around me. I was lucky enough to have my friends who trusted my vision and just let my mind spill over and out through my camera. For me, this photo is a huge reflection of who I am and it mirrors that time where you’re morphing and uncomfortable and unsure of what the future holds. But at the same time you’re so excited because you’re learning, growing, and acting on creative impulses. New Orleans is my favorite city and I’m so happy this work started there as well. My Dad is from NYC my mom is from New Orleans so this was the mixture of the two. I feel New Orleans gives me a lot to work with in terms of soul, color and composition. It’s a dark movie with bright colors, it has this eerie heaviness in the air yet it’s so colorful and celebratory. New Orleans is the place I hold closest to my heart and I was so lucky to have created this picture when I was living there full time. I miss it! YT: I read that you are living in New York, can you tell me a little about how much support a young artist like you can have from the city? Would you suggest others to move there right now? A: New York gave me more of the knowledge I have on the abstract. I was born and raised here but I moved to South Carolina in 2008 for High School, which I really did not like, then moved to New Orleans. I love the south and now being back in the city after a while of being away helped shape my perspective. I was so sad that I had to leave the city but I’m glad I moved and learned about other ways of life elsewhere. It opened my mind and it has helped me in the long run. So to me I think moving around is a great thing! Living in NYC you get a ton of support from so many people but not everyone has the funds or the support, like from family, a job, or friends, in the city to just up and move here. I feel that there’s so many beautiful things that you can’t get anywhere else and you have access to a lot of eye opening ideas. I’m not that kind of New Yorker that will never leave the Island and doesn’t think any where else is as special though. I don’t know how long I’ll be in New York cause I want to keep venturing out and seeing what else is out there. I think every artist, well every person, should come to NY and at least visit for a bit and really take in the diverse atmosphere. I think everyone works in their own way but I feel New York is different everyday and right now I need that constant inconsistency to keep pushing me to grow. If I could have a city that is half New Orleans and half NYC I would be moving there today! YT: Is there any artist (from another field) that you would like to collaborate with? A: Of course, of course. I love so many different artists in different fields so I always day-dream about working with them. Music wise I would love to help create visuals with Flying Lotus. His work is so beautiful and has that abstract jazz feel to it. His music videos for “Never catch me” and “Until the Quiet Comes” are my absolute favorite videos. I love that the music somewhat contrasts with the environment that the video is shot in. They both have elements of amazing dance, lighting, and have this very dark but oddly hopeful feel to them. The album that both of these songs were on is called “You’re Dead!” and for me I have always been interested in existential philosophy. I enjoy watching videos that are sincere and can mix abstract and reality together. So yes Flying Lotus is on the top of my list. I also think it would be great to work with an installation artist. Liz West’s work seems like it would fit perfectly with mine. If I could take pictures with my subjects in any of her installations I would in a heartbeat! YT: If you could choose a soundtrack for your pictures, how would it sounds like? A: It would most likely sound like jazz! Sonny Rollins more specifically. I improvise a lot of my work and I love that jazz embodies that ideal as well. I feel when I improvise there’s no real ceiling. I can just do all of the outrageous things that are on my mind and I feel courageous. I can take what I’ve been given through the location, the lighting that the sun is giving me, or how the subject feels and throw something back at that. It’s a back and forth for me which I love because it seems pure and unfiltered. YT: What is beauty for you? A: I find beauty in a lot of things. I think beauty is passion, trust, honesty, self-awareness, patience, discipline… I feel the most beautiful when I do something I never thought I could or I when I’m shooting. I feel really beautiful when I can help someone in anyway… I think small gestures go a long way. I think beauty is diligence, commitment, and refusing to succumb to any obstacle. I think beauty is being yourself even if it feels super uncomfortable to just go for it. I think beauty is sensitivity, empathy, and compassion. Beauty is basically all of those things that make you smile when you’re super super tired! YT: Can you describe “youth” for me? A: Youth is not giving up on your dreams. It’s keeping an open mind and not becoming stuck and not growing. I read that time seems to go slower when we’re children because we’re constantly learning new things. I think as we grow older we tend to not care to open our minds to new people or adventures. I think youth is always asking questions and maintaining your curiosity in life. All the photos are courtesy of Arielle Bobb-Willis. Posted on July 25, 2017 July 25, 2017 by antoniaspagnardi	This entry was posted in tales and tagged art, beauty, color, contemporary art, fashion, fine art, issey miyake, movement, music, new york, photography, shapes, youth. Bookmark the permalink.